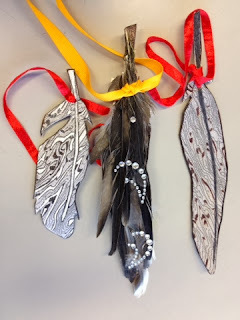 I am thrilled that the feathers I designed and submitted will be included in the collaborative exhibit in Canada. The exhibit and it's vision are by organizer extraordinaire Yanik Falardeau-Avoxta of Quebec, Canada, who wrote,"
"A central theme in my work is the idea of freedom and liberty. Birds always seem to appear in my pieces even when I try to steer clear of them as I’m painting. I’ve learned to just let it flow and I’ve fallen in love with my birds. I often work with recycled materials and I envision creating a large bird with it’s wings wide open." You can read more about her and this project's beginning here. Or click on the link in the right sidebar of this blog. Two of the "feathers" I submitted were created on recycled cardboard (packaging) and the decorative insides of business envelopes. The third feather was "contributed" by my cockatiel bird Cinnamon. He donated his shed feathers and then I blinged them up with sparkles from Close to My Heart®. Needless to say but I'm very proud to be a part of this exciting exhibit and wish I could see it in person. I admire Yanik's time, talent and devotion to this event! Thank you, Yanik. May this collaborative event be all you envision it to be and MORE! Thank you so much for being part of the adventure, Candice! I love your feathers and I greatly appreciate Cinnamon's contribution. Warm thanks for your kind words also. One day to go before the big event! I'll be broadcasting it live on Youtube! I hope you can tune it and even participate in a hangout on G+! ;-) Have a fantastic day! My Feathers Arrived in Quebec, Canada! !